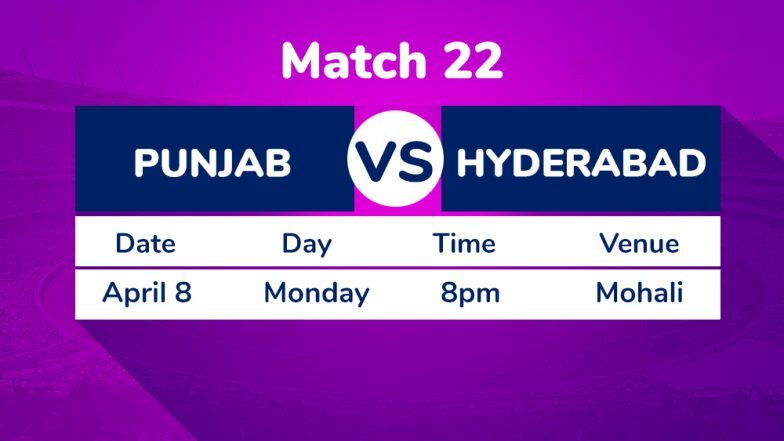 Mohali, April 7: Going into the weekend high on confidence, both Kings XI Punjab (KXIP) and Sunrisers Hyderabad (SRH) lost their respective games in the Indian Premier League (IPL) on Saturday and come Monday, they will look to get back to winning ways when both teams clash at the I.S. Bindra Stadium in Mohali. While KXIP have had a mixed journey so far in the tournament, winning three games and losing two, SRH were looking on a roll after the loss in their first game in Kolkata before Mumbai Indians (MI) pacer Alzarri Jospeh halted them in their own home ground on Saturday. Picking six wickets in his debut game, not only did he take MI to a convincing win, but also exposed the weakness in the middle-order of the SRH batting and that is something that KXIP skipper R. Ashwin will have taken note of as his team prepares to welcome SRH to their den on Mohali. For KXIP, it is a combination of failure in the pace bowling department as well as the lack of form of the middle-order that needs to be worked on and quickly. While Sam Curran and Mohammed Shami were brilliant in the game against the Delhi Capitals, they looked completely off colour in the last game against Chennai. In the batting department also, apart from KL Rahul and Sarfaraz Khan, the other batsmen have flattered to deceive. Kings XI Punjab vs Sunrisers Hyderabad Live Cricket Score 22th T20 Match. But luckily for them, they will be back on home conditions and the pacers will definitely get more help than what they got in Chennai. Batting wise too, it will be easier in Mohali as the ball will be coming onto the bat unlike in Chennai where one needs to force the pace. SRH skipper Bhuvneshwar Kumar will also hope that the faster pace of the wicket in Mohali will help his opening combination of David Warner and Jonny Bairstow. They had a rare failure on Saturday when Joseph sent them packing, but considering their desire to excel, they will come back roaring on Monday.